This country has completely turned upside down. 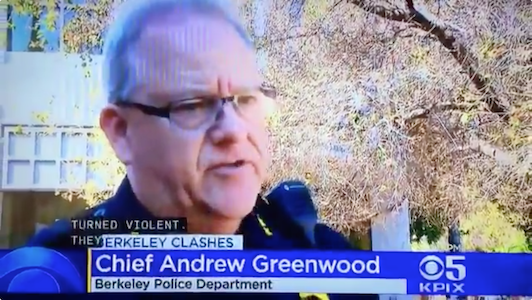 Berkeley Police Chief, Andrew Greenwood has made it official whose side he is on. Is anyone really surprised to hear about another Leftist leader giving support to antifa? Democrats you own this violent group 100%, when they start burning towns and cities down don’t try to blame anyone on the Right. You have officially gotten in bed with the devil. Now we know why Police were not quick to react, stood down leaving Trump supporters and others at the mercy of these communists. America, you’ve heard this language before from a city leader… Mayor Stephanie Rawlings-Blake gave a similar order for police to stand down, “we ‘gave those who wished to destroy space to do that’”, which allowed the destruction of Baltimore following the death of Freddie Gray. It’s now just a matter of time until this group of communists does the same to a town or city, but far worse. Along with the count of burned buildings, we will soon be dealing with bodycount, as these domestic terrorists have the “blessing” of democrats, media and some in law enforcement.